GAITHERSBURG, Md. and SAN FRANCISCO, March 25, 2019 /PRNewswire/ -- It's something your mom always told you – eat your breakfast – and now college students are starting to do just that, thanks to Starship robots and Sodexo. Research has shown that up to 88 percent of college students skip breakfast, primarily because of lack of time, but that number is starting to turn around when delivery robots arrive on campus. Starting today, students at Northern Arizona University's (NAU) Flagstaff campus will have the convenience of receiving food delivered by robot. Sodexo, Inc. and Starship Technologies launch robot delivery service today at Northern Arizona University. A Starship robot delivers breakfast to a Northern Arizona University student. Northern Arizona University students enjoy coffee delivered via robot from Einstein Bros. Bagels. 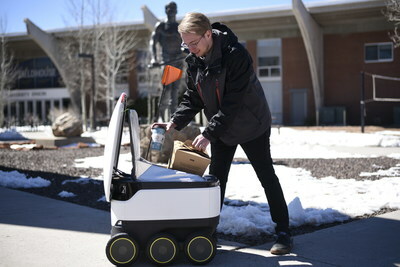 Two Starship robots cross the street at Northern Arizona University, the newest location for its robot delivery service developed in partnership with Sodexo. 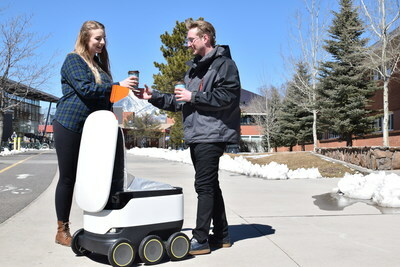 Today, Sodexo and Starship Technologies expand its robot delivery service to Northern Arizona University in Flagstaff, Arizona. Today, Sodexo and Starship Technologies expand its robot delivery service to Northern Arizona University. The robots are featured next to the University’s iconic Lumberjack statue. 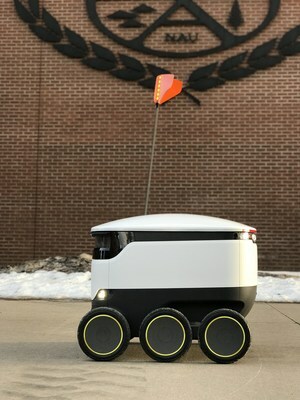 Sodexo, Inc. and Starship Technologies revealed today that an extra 1,500 breakfast orders have been delivered autonomously since the two companies joined forces to debut the Starship delivery robots on the campus of George Mason University (GMU) at the end of January. This follows a similar pattern seen at corporate campuses where delivery robots were added. To help celebrate the launch of a fleet of more than 30 robots on campus and raise awareness of the breakfast offerings, the companies are partnering with Einstein Bros. Bagels and offering free breakfast for the remainder of the academic year to the NAU student who places the first order via the Starship app. The school's nearly 25,000 students and faculty can now use the Starship app (iOS and Android) to order food and drinks from local retailers to be delivered anywhere on campus, within minutes. Each on-demand delivery costs just $1.99 and also works in conjunction with the student meal plan. Other participating retailers include national chains Star Ginger, as well as on-campus restaurants Cobrizo Mexican Grill, Turnip the Greens, G's New York Style Deli, and The Wedge Market and Pizza. "I'm really excited for these robots! Having the ability to get breakfast delivered right to my door simply with my meal plan will be a lifesaver for early classes and long days," said NAU student Josh Feygin. This also marks one of the first times that sidewalk delivery robots are operating in Arizona. The state is one of seven that have approved the operation of delivery robots. The legislation was largely championed by Rep. Kelly Townsend, R-Mesa. Townsend said, "Last year I sponsored HB 2422 in an effort to clear the way for personal delivery devices to operate in Arizona. It's great to see the hard work of many stakeholders come to fruition with the introduction of the robots in Flagstaff. I look forward to this cutting-edge technology being implemented to other parts of the state as well." To get started, users open the Starship Deliveries app, choose from a range of their favorite food or drink items, then drop a pin where they want their delivery to be sent. They can then watch as the robot makes its journey to them, via an interactive map. Once the robot arrives, they receive an alert, and can then meet and unlock it through the app. The delivery usually takes just a matter of minutes, depending on the menu items ordered and the distance the robot must travel. Each robot can carry up to 20 lbs – the equivalent of about three shopping bags of goods. "We've been very pleased with how quickly Starship has been embraced on college campuses," said Ryan Tuohy, SVP, Business Development, Starship Technologies. "These campuses are hubs of innovation and activity, with both students and faculty needing convenient and flexible services. Our on-demand delivery is perfectly suited to this environment and we can't wait to introduce our robots to the students and faculty at Northern Arizona University." "Sodexo oversees dining services at more than 700 colleges and universities which gives us unique insights into the evolving needs and preferences of students," said Barry Telford, CEO, Universities West, Sodexo North America. "Today's college students are prolific users of food delivery apps and they place a high value on convenience, ease and diversity of options, so we are thrilled to be able to provide this cutting-edge robot delivery service to Northern Arizona University via our partnership with Starship." Starship Technologies operates commercially on a daily basis around the world. Its robots have traveled over 150,000 miles. The robots use a combination of sophisticated machine learning, artificial intelligence and sensors to travel on sidewalks and navigate around obstacles. The computer vision-based navigation helps the robots to map their environment to the nearest inch. The robots can cross streets, climb curbs, travel at night and operate in both rain and snow. A team of humans can also monitor their progress remotely and can take control at a moment's notice. "Northern Arizona University is proud to partner with Sodexo and Starship to bring this creative and innovative technology to our Flagstaff campus," said NAU President, Dr. Rita Hartung Cheng. "This new robot delivery service complements the service on our premier residential campus and serves to enhance the exceptional dining and food offered to our students, faculty and staff." Sodexo and Starship plan to continue to expand the program to additional campus locations globally in the future.